Corey Crawford and the Blackhawks shut out Columbus 1-0. Corey Crawford and the Blackhawks continue to be winners. Weaving watching sports and viewing my favorite non-sports event of the year (the Academy Awards) was like Danica Patrick trying to maneuver the Daytona 500. Topping the winners list is the Blackhawks. 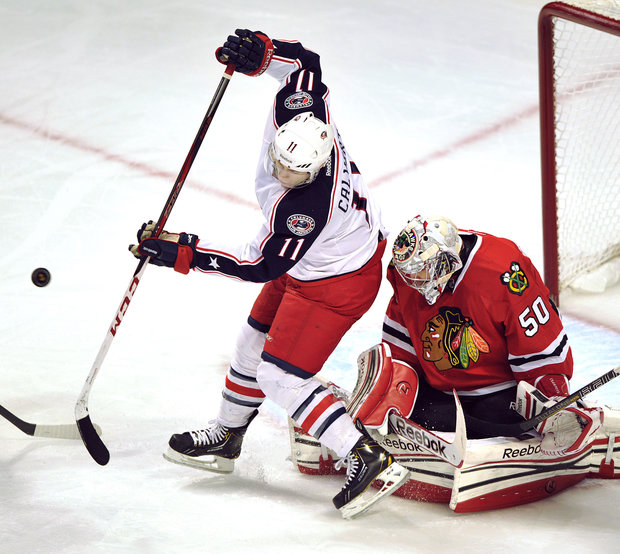 It wasn’t pretty, but they beat Columbus 1-0 at the United Center. They are now 15-0-3, extending their NHL record for starting a season. You know things are going well when goalie Corey Crawford earns a shut-out after sitting out two weeks with an injury. Crawford stopped 28 shots, but credits the work done by his teammates in front of him. “Everyone&apos;s playing hard, making the right plays, not turning pucks over and guys are coming back to help out our ‘D,’ he said. "Our ‘D’ has been so good this year in blocking shots, sticks in lanes. It&apos;s just another solid victory for us." This was the second shut-out for Crawford this season. The only goal of the night was scored by 21-year-old Andrew Shaw in the waning moments of the second period. This is a tough gritty kid and his play in front of the net is gaining attention. Shaw now has four goals on the season. The Blackhawks don&apos;t have time to think about last night&apos;s win: they get back to the United Center tonight to host the Edmonton Oilers. A horrible shooting night by the Bulls resulted in a 30 point blowout for Oklahoma City. The Bulls 102-72 loss to the Thunder is the second bad loss in the past three games. Tom Thibodeau’s club shot a mere 29 percent from the field and the Bulls were outrebounded. Luol Deng and Nate Robinson each scored 13 in the loss. Thunder’s All-Star point guard Russell Westbrook led all scorers with 23 points. His teammates Kevin Durant had 19 points and 16 rebounds and Serge Ibaka added 17 points and 10 boards. The Bulls will now limp home and get back in action on Tueday when they host Cleveland. Another unfortunate loser yesterday happened during the first game of spring training. Yankees outfielder Curtis Granderson was hit by a pitch, broke his right forearm and is out for ten weeks. The native Chicagoan is mentioned since we just featured him a few weeks ago about are philanthropic work with University of Illinois-Chicago. She wasn&apos;t a winner crossing the finish line, but Danica Patrick was a winner in other ways this weekend. The Daytona 500 is not a real interest of mine, but she did get me watching the final laps. Danica Patrick, the pole setter, was in the third position and wound up finishing eighth. Jimmie Johnson was the winner. Patrick&apos;s finish is the best ever by a woman. She also had the lead for five laps: another first for a woman.